Since I started baking bread we have a full pantry. 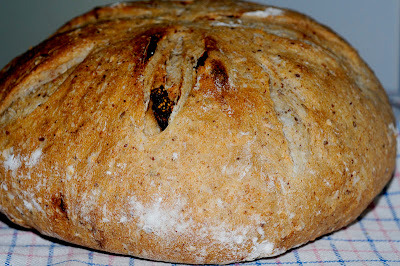 When I started baking bread there was almost nothing related to baking bread in my pantry. Now, more than a year later, my pantry is filled with different kinds of flour, seeds, nuts, dried fruits, pots, baking pans, stones for steaming, bannetons, etc. I want to use all ingredients I buy because I hate throwing away food. But being frugal also leads to somewhat crazy behavior. I want to use everything I bought, but I also want to keep some since it’s not so easy to buy most ingredients. It’s almost a 200 kilometer drive to the nearest big bakery shop. Many ingredients are imported which makes them expensive. Peter doesn’t understand this contradiction in my behavior. He is able to eat and enjoy all that’s here, even though he knows it take months or years before he can eat it again. Being too frugal also leads to disappointment, because sometimes I keep an ingredient too long and it gets rancid or stale or old or rotten or … You get the picture. But, since I want to live an aware life I’m determined to learn and change this behavior. Now I use what’s in my pantry before I buy new ingredients. I saw these delicious dried figs our friend brought from the Netherlands. And they’re also organic! I immediately took them out and looked for a nice recipe. Whenever I want to bake non-fail bread, I go for Norwich Sourdough. This time I changed it, so it isn’t probably Norwich anymore, but it’s still non-fail recipe. The change I really love is the partly rye starter. I use 25% of rye in the 100% hydrated sourdough starter. It makes so a big difference in taste and flavor. I keep flaxseed in my refrigerator. Since I don’t want these seeds to go rancid I try to use them as often as I can. I used to soak the seeds to make them chewable. Our digestive system cannot always digest partially chewed kernels like un-chewed flaxseed. Whole flax seeds remain unbroken; they may pass undigested through the body, reducing the nutritional advantage of eating flaxseed in the first place. And secondly then flaxseed simply becomes expensive roughage. So to get the most health benefit from these little seeds I grind them. I grind them just before I add the flaxseed meal to the dough. Ground flax seed gets rancid more quickly. This is what I used: (the original) for 1 big loaf. Cut the figs in medium pieces. Ground flaxseed and add to the flours. Mix all ingredients except the figs and salt until just combined. Leave the dough to rest (autolyse) for 30 minutes. Add the salt and mix on low speed until the dough reaches a medium level of gluten development, 3 – 4 min. During the last minute add the pieces of dried fig. Transfer the dough to a slightly oiled container, cover and leave to ferment for 2.5 hours, with folds at 50 and 100 minutes. Turn the dough out onto a lightly floured counter. Pre-shape the dough into a light ball and sprinkle lightly with flour. Cover with plastic, and leave to rest for 15 minutes. I shape it more tightly into a ball and placed it on floured couche. Or you can place it upside down in a floured banneton. Because of the temperature in our house it proofed after 1.5 hours. 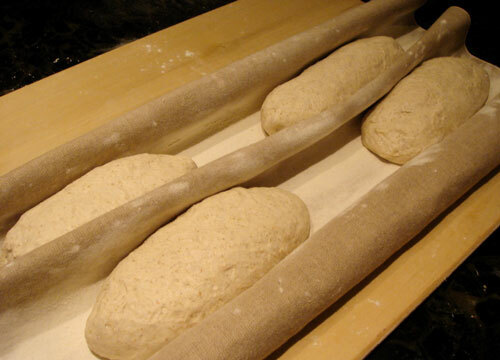 Once the loaf is in the oven, turn the heat down to 230°C and poor the boiling water on the hot stones. I baked it for 15 minutes with steam, and another 25 minutes without steam. Ah, would that I were in your kitchen when this came out of the oven ... I'd have contributed at least some excellent Irish butter ... and maybe there'd be wine. I have to laugh at your pantry because mine is just like that ... and my freezer and the refrigerator too. You're welcome Tanna in our kitchen. I know I'm not only one with an expanding pantry. As I start baking again, my pantry is also becoming more and more full. However, I've started rather slowly, and right now, it's all so new. It's fun. Nice to hear you started baking again, welcome back. Thanks, this bread tastes delicious too. Oh, nice! I can just imagine the satisfaction a slice of this bread brings. I love those figs studded throughout and the addition of the flax. Frugal can be a good thing...and I know I've had many the same ordeal. I just hate throwing away food! When I bake the next Sourdough with fig and flax I'll send some over. This one is gone already. So, I'm not always frugal.